It’s no secret that Red Hat has a lot to offer customers, partners and the entire open source ecosystem. Red Hat has long been at the core of a multi-billion dollar (and growing) open source industry. We changed the dynamic of the technology industry and delivered tremendous value to thousands of customers in the process. But keep your eye on Red Hat, because this is just the beginning of our journey to build the defining technology company of the 21st century. Linux Magazine recently recognized twenty companies in the free and open source software community that it thinks will have an impact on the market in the year to come. Red Hat was on the list, alongside Sun and Microsoft, and the usual suspects like Mozilla and Alfresco. To find the "movers and the shakers" included in the the article, Linux Magazine checked in with industry experts, polled on-line readers and mined their own observations of the open source industry in recent years. Our inclusion on the list is not surprising given Red Hat’s track record around Linux – the article notes that our name is "nearly synonymous with Linux" and that we’re the "first company that corporations turn to when they want Linux." Given that track record, industry-watchers and the market expect more. The JBoss acquisition expanded our reach to enterprise middleware space, and provides tremendous new opportunities. Our development model, based on Community engagement, resulting in the vibrant Fedora distribution, gives us the ability to leverage innovation faster, better and on a much larger scale. The threat of recession, a global credit crunch and political uncertainty threaten to distract many companies in the coming year, and most technology companies are bracing for a downturn. But the innovative Red Hat culture and our relentless focus on creating value gives us a distinct advantage in trying times and provides a strong foundation for Red Hat to stay independent and on top in 2008. Hard times mean companies have to extract more value from IT, and that’s what Red Hat does best. Today we have customers of all shapes and sizes, across nearly every industry, located around the world. As our customer list grows, so does our expertise. Our customers are our legacy, and Red Hat continues to focus on enhancing our customers’ experience. So while times and business conditions change, and Red Hat grows its core business and expands into new markets, our fundamentals remain the same: high value at low cost – helping customers do more with less. 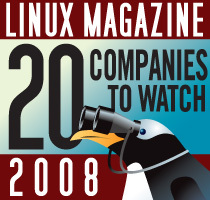 We’re honored to be on Linux Magazine’s "Top 20 Companies to Watch in 2008" list and plan to deliver exciting enhancements to our solutions and to the industry over the next 12 months, whatever challenges come our way. Keep your eye on us.